SONOSIM SUMMARY: A study published in the American Journal of Emergency Medicine has demonstrated that using a patellar cupping technique while performing knee ultrasounds may increase ultrasound sensitivity for detecting knee effusions. The technique involves “placing pressure on the medial side of the patella, in the infrapatellar pouch and on the lower side of the lateral knee.” For this study, knee effusions were produced by injecting varying volumes of normal saline into four unembalmed cadaver knee joints, and effusion depths were measured by means of ultrasound with and without the cupping technique. Results suggested that using the cupping technique increased the mean depth of all effusions and especially improved detection of smaller subclinical effusions. Potential limitations of this study include a small sample size and the use of cadavers instead of living patients. Regardless, this study promotes a technique for knee effusion detection with ultrasound that is easy to apply in a clinical setting, and may make ultrasound-guided arthrocenteses easier. Uryasev O, Joseph OC, McNamara JP, et. al. Novel joint cupping clinical maneuver for ultrasonographic detection of knee joint effusions. Am J Emerg Med. 2013 Sept;31(11): 1598 – 1600. Knee effusions occur due to traumatic and atraumatic causes. Clinical diagnosis currently relies on several provocative techniques to demonstrate knee joint effusions. 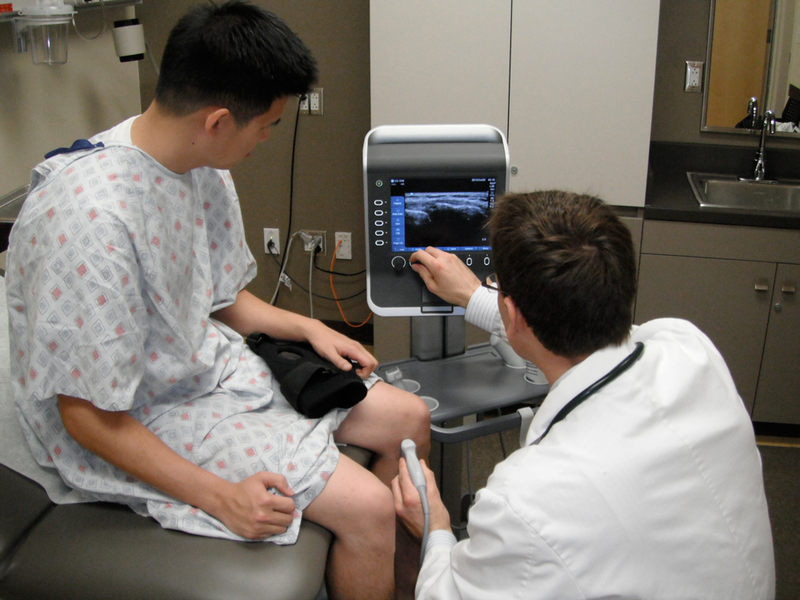 Portable bedside ultrasonography (US) is becoming an adjunct to diagnosis of effusions. We hypothesized that a US approach with a clinical joint cupping maneuver increases sensitivity in identifying effusions as compared to US alone. Using unembalmed cadaver knees, we injected fluid to create effusions up to 10 mL. Each effusion volume was measured in a lateral transverse location with respect to the patella. For each effusion we applied a joint cupping maneuver from an inferior approach, and re-measured the effusion. With increased volume of saline infusion, the mean depth of effusion on ultrasound imaging increased as well. Using a 2-mm cutoff, we visualized an effusion without the joint cupping maneuver at 2.5 mL and with the joint cupping technique at 1 mL. Mean effusion diameter increased on average 0.26 cm for the joint cupping maneuver as compared to without the maneuver. The effusion depth was statistically different at 2.5 and 7.5 mL (P < .05). Utilizing a joint cupping technique in combination with US is a valuable tool in assessing knee effusions, especially those of subclinical levels. Effusion measurements are complicated by uneven distribution of effusion fluid. A clinical joint cupping maneuver concentrates the fluid in one recess of the joint, increasing the likelihood of fluid detection using US. To read the complete article, visit The American Journal Of Emergency Medicine website by clicking here.